Why spend so much money on travelling abroad for an adventurous vacation when you can experience all the fun and thrills in India at a fraction of the cost? India offers tremendous opportunities for adventure tourism – from scuba-diving and trekking to para gliding and skiing, the country has a lot to offer. 1. Hang Gliding at the Nilgiris – Up above the world so high…like a diamond in the sky! Fly like a bird over the dense forest, beautiful waterfalls and streams of the Nilgiris in Kalahatty hills, just 20kms from Ooty. 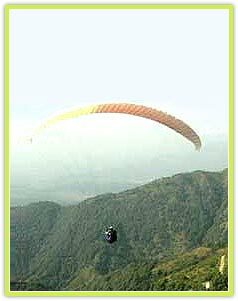 The attractive ‘Blue Mountains’ or Nilgiri Hills in Tamil Nadu are not just famous for its pristine beauty but also for adventure sport like hang gliding. This exciting fun filled sport takes soaring to look down on the picturesque surroundings. Hang gliding involves hanging suspended by a harness from a large type of kite known as a hang glider. You may also get a peek at some wild animals in the sanctuary down below. It will surely be an experience to remember forever. 2. Ice climbing on the Himalayas – Adventure and risk go hand in hand and if you think you are brave enough to take the risk, try climbing the walls of ice in subzero temperature. Ice climbing on the magnificent Himalayas is considered one of the most thrilling winter sports. Though the techniques used in ice climbing is the same as in rock climbing, the difference is that you need few more tools which will help you climb on vertical ice sheets. Uttaranchal and Manali are the top destinations for ice climbing. 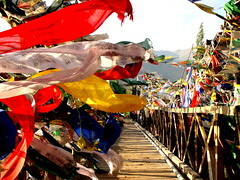 Other places for this adventure sport are Zanskar, Ladakh and Gulmarg in Jammu & Kashmir. Best time to go – Mid January to Mid February. 4. Glacier Trek from Gangotri – It is said that the hardships of trekking at high altitude are a life altering experience. Trekking on the Gaumukh Glacier in Gangotri surrounded by mountains and clouds will satisfy your inner adventurer. The locals say that the glacier is shaped like a cow’s mouth, which is where it gets its name. This glacier is the source of the Bhagirathi River which eventually joins into the sacred Ganges River. This 14km trek from Gangotri to Bhowasa, where the gentle sound of flowing water of river Bhagirathi is your constant companion, will refresh your mind and leave you at peace. If you think trekking on this glacier is going to be simple, then you are just mistaken. This glacier which is at 4255m above sea level is full of stones and rocks which will make the trek a little more adventurous. So enjoy the picturesque scenic beauty while you put some effort into it! 5. Take the High Road between Manali and Leh – If climbing the rocks and ice is not adventurous enough for you, then this tough two-day drive in a jeep or on a motorbike will blow your mind! 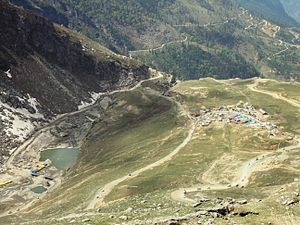 The 300 mile road which connects Manali to Leh is considered the second highest motorable road in the world and achieves a height of 17,480 feet at the Taglang Pass. This trip is not for the faint-hearted or for vertigo suffers. The road is very narrow and has many twists and turns but the mesmerising landscapes, mountain passes and Buddhist monasteries will surely please you. If two days of continuous driving seems exhausting, then you can make overnight stops at the tent camps along the way. This is an adventure suited for the very hardy! Best time to go – The road is open only from mid June to early October. 6. Heli Skiing at Manali – If you think you have tried every adventure sport, then this then the following activity may possibly surprise you. Heli Skiing is an much more exciting and dangerous variant to skiing where a helicopter will take the skiers to a high altitude of 6,500m and leave you at the snow covered peak. The skier will have to criss-cross his way down till he reaches the finish. A tough task by any measure! However, this sport involves high risk of landslide, sudden weather changes, snowstorm and many unknown dangers that appeal to true adventure seekers. Rohtang Pass, Hanuman Tibba, Chandrakhani Pass and Deo Tibba region near Manali are the hot places for Heli Skiing. 7. Zipline at Neemrana Fort – Ever thought of flying between the trees at a certain height in jungles where birds and monkeys hang out? Just about 2 hours drive from Delhi at the Neemrana Fort you can enjoy this terrific adventure activity. Zipline is a unique and thrilling aerial sport which consists of a pulley suspended on a cable. Ziplining is not recommended for the weak hearted. Zipline tours takes about two hours which also includes a challenging walk to the great forts. You can also enjoy the sensational views of the Neemrana Fort and the stunning Aravali hills. It is one of the “must do” in India. 8. Hot air ballooning at the Pink City – Flying in a hot air balloon over the sandy terrain of Rajasthan, getting a view of the historic forts and magnificent palaces is an exciting alternative for those unwilling to jump out of a perfectly good aircraft. Sky Waltz’s hot air balloon ride gives you an opportunity to experience the Pink City from a quiet place high above the crowds. The best attraction, of course, is to coast over the camel fairs in Pushkar, or view wild animals at Ranthambore Wildlife Sanctuary in a hot-air balloon. Hot air balloon is a relatively new adventure and is gaining popularity. It is a little expensive but that’s the price you have to pay to enjoy the ultimate feeling of freedom. 9. River rafting at Zanskar – Water sport adventures are the best way to beat the heat and Zanskar in Ladakh is the only river inIndia where rafting in the summer is possible. The 150 km long Zanskar River is an adventure lover’s paradise and is one of the most popular white-water rafting destinations. It contains some of the most deadly rapids of the world as it passes through very remote and difficult to access terrain in Ladakh. As the river passes through many small villages you will often find that the inhabitants will come out to greet travellers making for a truly unique experience. So come and experience one of the most exotic rafting journeys in the world! 10. Parasailing in Goa – Adventure, fun, excitement, these are the words that come to mind when thinking of Goa. One of many adventure sports people can take part in is parasailing. When the air roars past your body as it dangles from a parachute at 300 feet you cannot but marvel at your surroundings and speeding green seas below you. A rope about 300 feet long is attached to the speedboat at one end and the parasail harness at the other end. As the speedboats speeds up on the sea, the para sailor flies up in the sky. Candolim beach, Majorda beach, Anjuna beach and Baga beach are some of the many places for parasailing. Posted on August 21, 2012, in Adventure, Sports, Travel and tagged Andaman Islands, Bhagirathi River, hang gliding, India, Ladakh, Manali, Manali Himachal Pradesh, Nilgiris, Rohtang Pass, Zanskar. Bookmark the permalink. Leave a comment.